Google has announced plans to operate new data centers for cloud services in South Korea by early 2020, as the global tech giant seeks to diversify its business amid growing competition in the market. During its annual Cloud Next conference in San Francisco on Tuesday, Google said Seoul is one of the two cities it is eyeing to expand its Google Cloud Platforms. It also plans to tap Salt Lake City in the US to operate new data centers. 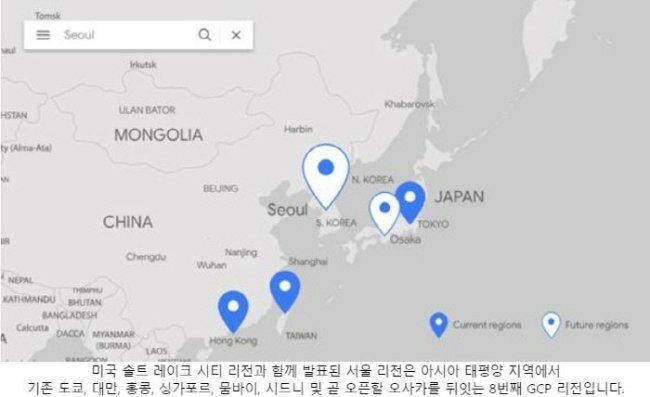 According to Google, Seoul will become the eighth city to operate data centers in the Asia-Pacific region for its cloud services, following other locations such as Tokyo, Taipei, Hong Kong and Singapore. The company has been preparing to launch data centers here since it established Google Cloud Korea last year. Instead of making massive real estate investments, it plans to tie up with local telecom companies to operate its data centers. The announcement came as Google has been trying to bring in new revenue from businesses other than its online advertising operations. The company has been leaning on its massive storage and data infrastructure to compete with Amazon and Microsoft for high-end business customers. Its rivals have been growing their presence in the cloud service market since they began operating data centers in Korea a few years ago. Amazon established its center in 2016 and Microsoft followed suit a year later. Oracle is also expected to operate a data center within this year.